16.07.2016 (Hvino News). 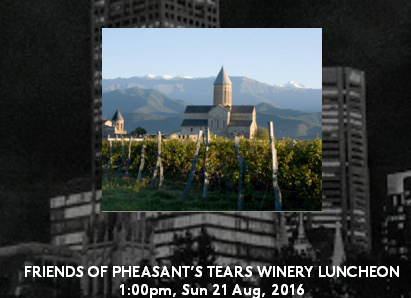 Melbourne's chefs are combining their talents to raise funds for Georgian winery Pheasant’s Tears, which was devastated by a fire last December. Arbory Bar & Eatery, which features the wine brand on its wine list, will host the fund-raising event on August 21. Hosted by Arbory’s wine director Raul Moreno Yague and TWR’s food editor Alice Zaslavsky, the event promises to be foodie heaven. Guests will be treated to a rare insight to Georgian wine making traditions and varietals. Better yet, the wines will be matched with a four-course menu from Abory’s executive chef Nick Bennett, alongside Andreas Papadakis from Tipo 00 and Sam Stafford of Clever Polly’s, concluding with dessert by pastry chef Matt Forbes of Yarraville’s Cobb Lane. Alice, who was born in Georgia, says she wanted to get involved as soon as she heard about the event. “I’m looking forward to working with these top chefs to recreate some Georgian classics,” she says. “When I was there in 2014, a young Georgian chef, Luka Nachkebia, who could best be described as a Georgian Matt Preston, took us under in his wing and showed us the best of Tbilisi’s food and wine scene. “I came away heartened and hopeful about the future of Georgian food and winemakers,” she says. Alice is confident Melbourne foodies will relish the chance to experience something out of the ordinary, and hopes it will bring Georgian food to a broader audience. “I know Melburnians will embrace this event. It couldn’t be more Melbourne. “There are about 160 Georgians living in Melbourne, and seeing I’m one of them, it’s going to be like taking everyone to my place for a family feast,” she says. Alice has been honing her knowledge of traditional Georgian dishes in preparation for her hosting duties. As far as Alice is concerned, the foodie highlight of the event will be khachapuri, a Georgian cheese pie of sorts, created by Anthony Femia from Maker & Monger.